Designed by Chuck Paine and built by Victoria Yachts this double ended small cruiser has gone through a few incarnations. 3 variants of the Frances were built in the UK by the two Victoria Yachts companies after Peter Gregory obtained the license to build and bought a splash moulding from Morris Yachts. 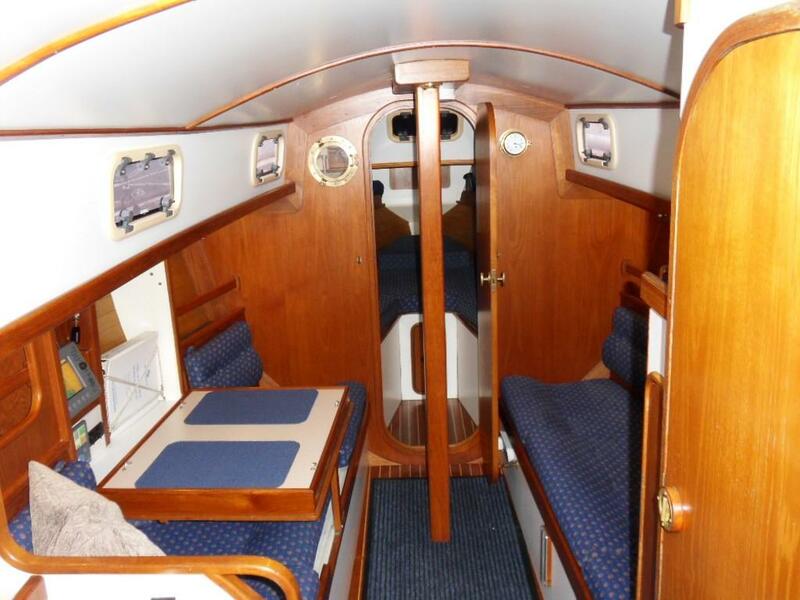 The Frances 26 was fitted with a small coachroof to provide standing headroom in the saloon / galley area of the then standard layout The Victoria 26 was then developed with a full length coachroof to provide standing headroom into the forward cabin and enclosed forward heads. The Victoria 800 was created in 1995 to combine the best of the two predecessors. As is said "Classics last longer than fashions" but this one has been modernised by conversion to electric (Hybrid) power. 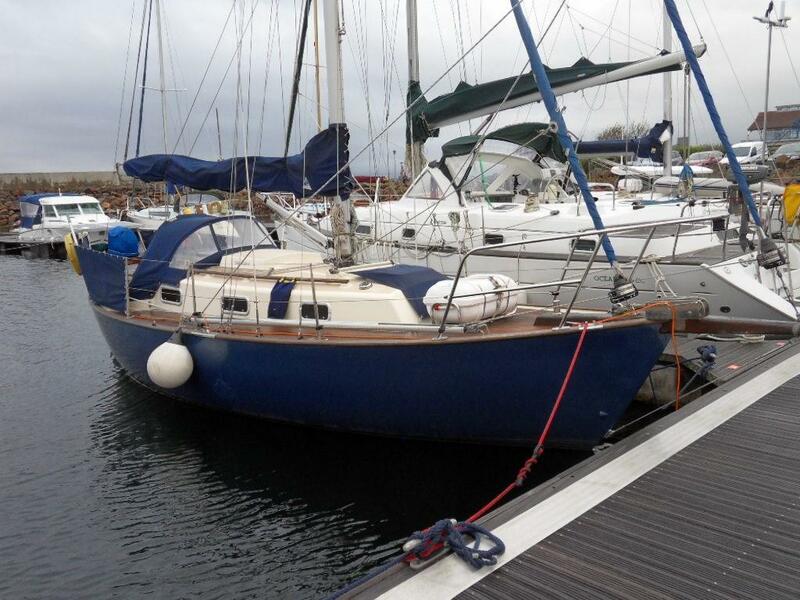 A tremendously capable sea boat ready to take you anywhere. Designed by Chuck Paine and built by Victoria Yachts this double ended small cruiser has gone through a few incarnations. 3 variants of the Frances were built in the UK by the two Victoria Yachts companies after Peter Gregory obtained the license to build and bought a splash moulding from Morris Yachts. The Frances 26 was fitted with a small coachroof to provide standing headroom in the saloon / galley area of the then standard layout The Victoria 26 was then developed with a full length coachroof to provide standing headroom into the forward cabin and enclosed forward heads. The Victoria 800 was created in 1995 to combine the best of the two predecessors. As is said "Classics last longer than fashions" but this one has been modernised by conversion to electric (Hybrid) power. 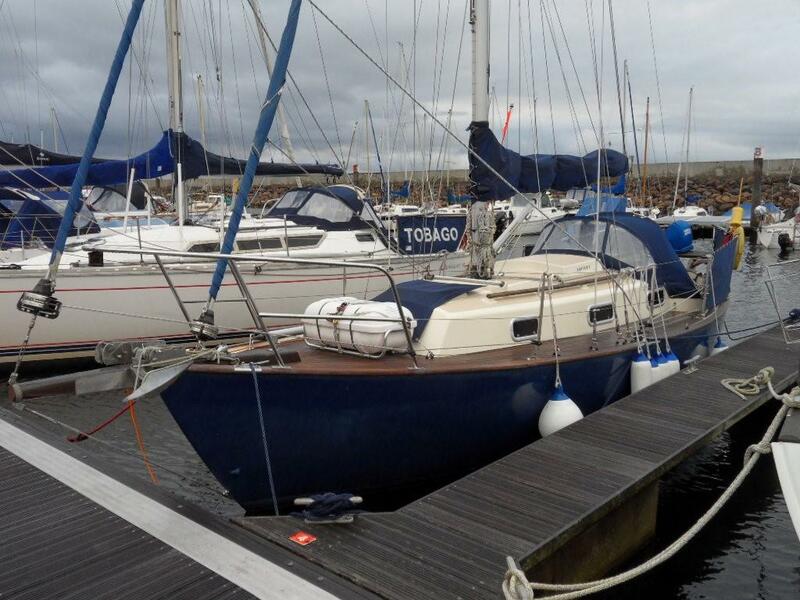 A tremendously capable sea boat ready to take you anywhere. Forecabin with traditional "v" berth arrangement. Main bulkhead with door separates this from the main saloon. 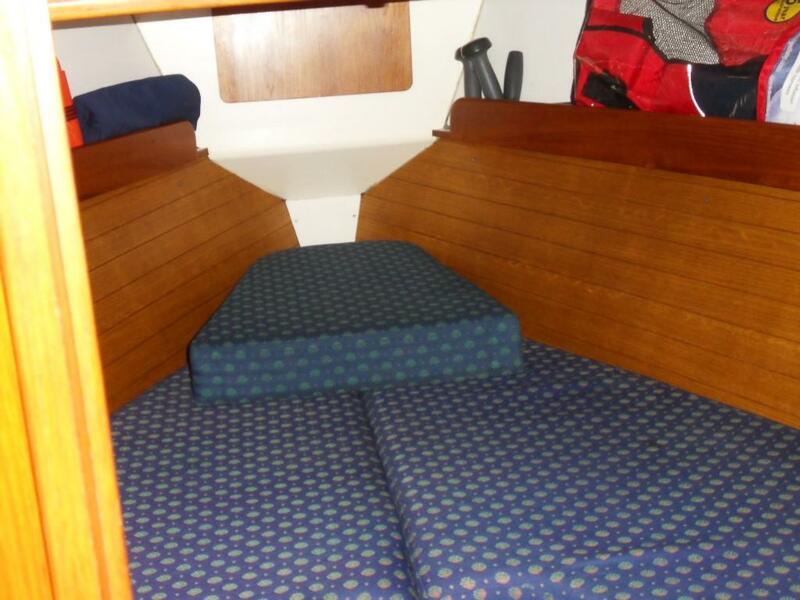 Settee berths either side of saloon with removeable table (can be used in cockpit also). 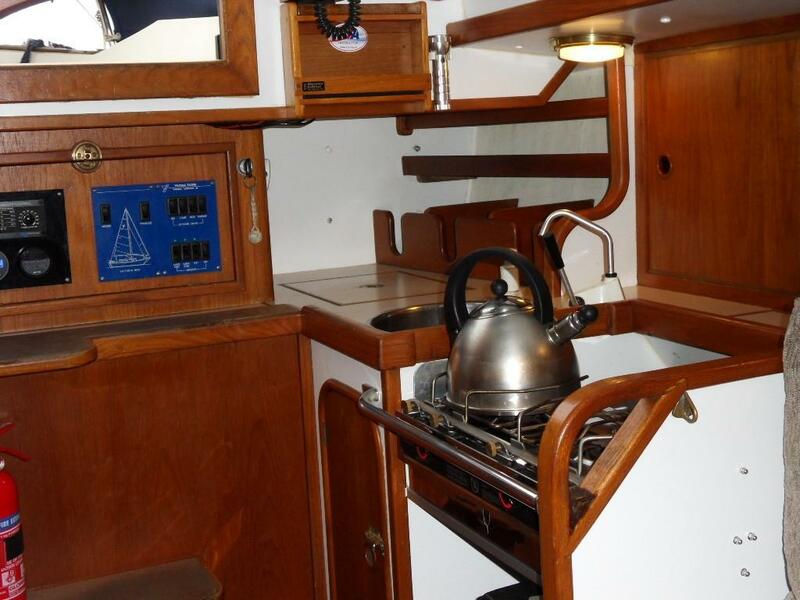 Galley at aft end to port and heads compartment opposite to starboard. All in good condition with blue upholstery. 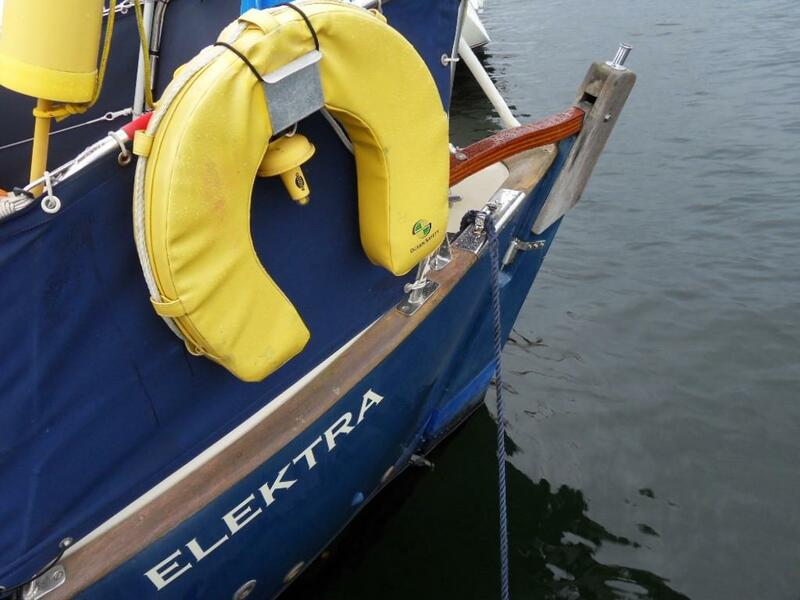 In short the electric motor system is equivalent to the original 10hp Volvo diesel for brief, short term manouvering such as marinas, anchoring and picking up buoys. Like the original diesel it is classed as an auxiliary engine. 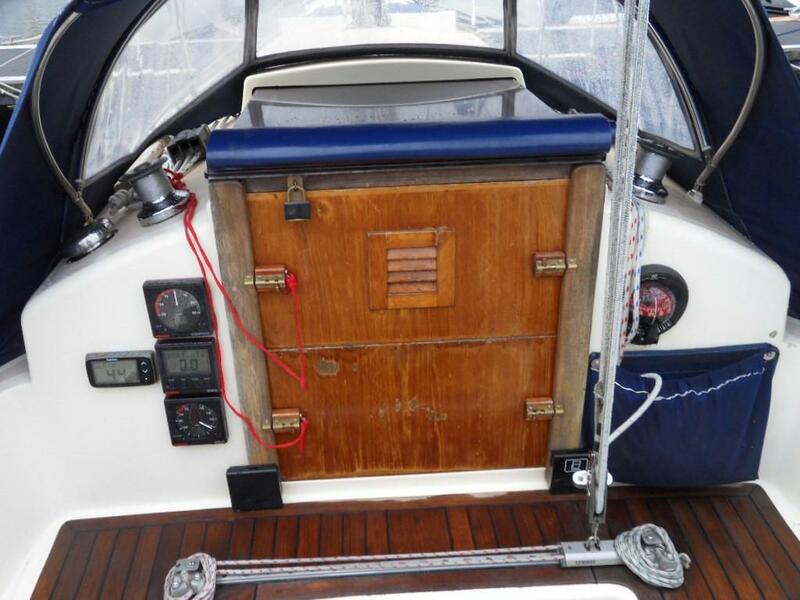 The original diesel was good for around 4.0 to 4.5 knots motoring in calm seas. The electric is best in the 3.5 to 4.0 knots region, for reasons of economy. 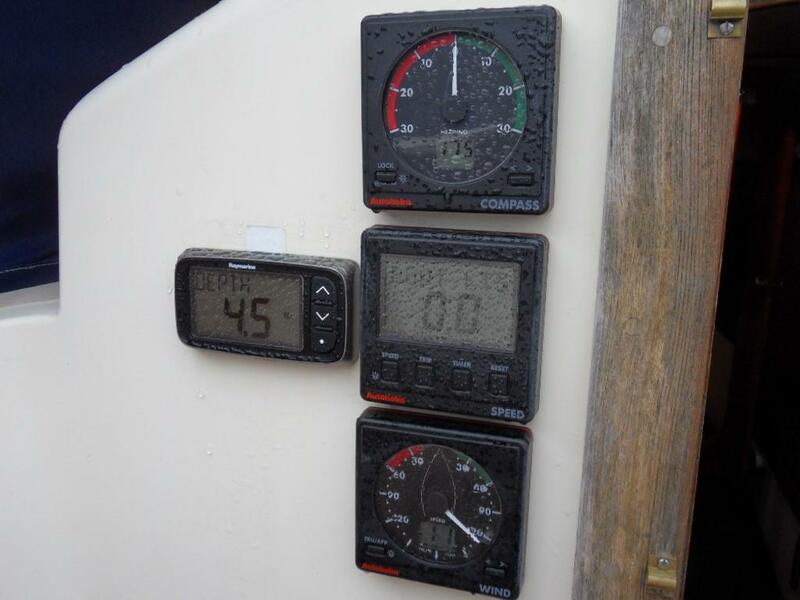 Top speed around 4.5 knots. It would have been easy to exceed the diesel power but that made the conversion uneconomical. As it is the lithium and AGM house batteries cost as much as a new diesel. Range in that 3.5 knots to 4.0 knots region is around 20 miles on batteries only. The 1 kVA (900W continuous output) range extender generator is plumbed in permanently and the range without using anything from the batteries at 3.5 knots is simply as much as the petrol you carry. I carried 1 x 5litre tin which is in the aft locker and that was good for around 8 hours of motoring. Of course using the generator (apart from its range extender application) is more of a backup, get you home or recharge if required. The lithium batteries should be good for 10 years as they have a very high cycle life (2,500) compared to lead acid (500). And of course it's always available, so no more stuck in irons either. 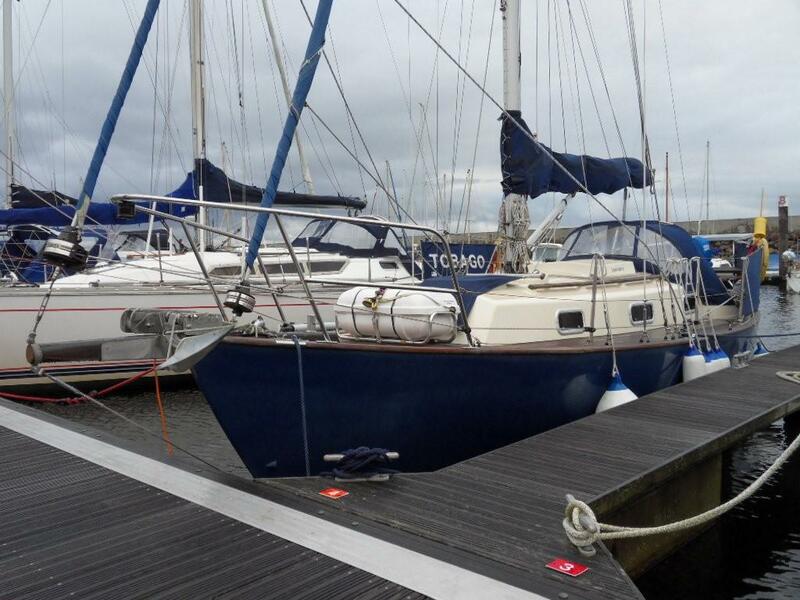 It will also regenerate once you hit 5.5 knots under sail but it is a tiny amount. If it were a bigger boat (longer/faster) it would regenerate significant amounts. Propulsion batteries Victron Lithium Ion Phosphate 2 x 200 Ah in series, 12.8 nominal voltage so 25.6V and can take down to 20 depth of discharge. Good for 2,500 cycles compared to AGM 500 cycles. 2 x 30W solar panels in series with MPPT solar charge controller. Keeps up with all instruments in summer but not fridge. Typically 2.5 times panel rating of 60W so 150Wh/day and max 5 times so 300Wh energy per day into domestic batteries. This gives a total of 1.05kW charging in port and 750W on the range extender. 1 x MultiPlus Inverter/Charger 24/800/16-16 = 384W (The 800 means 800W when used as an inverter for say a 600W travel kettle, 700W George Foreman grill, Electric blanket etc). 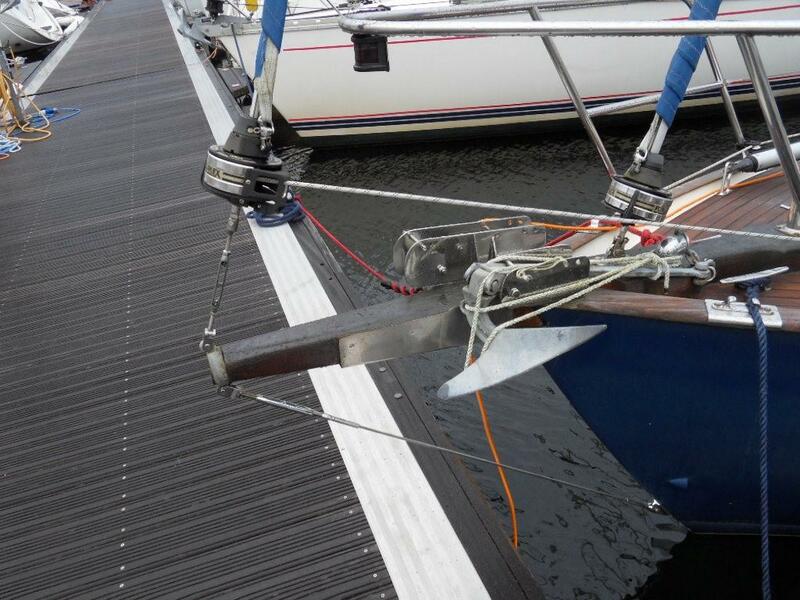 The reason there are separate chargers is so you can do a fast recharge in port (say 4 hour free marina visit such as Largs and Portavadie) and there is always 100% system redundancy should a charger fail. Additional charging from solar to offset fridge use and to keep domestic batteries fully topped up when system shut down over winter. The 2 x 30W solar panels give around 2.5 x the 60W panel rating on average in summer = 150Wh stored energy and up to 5 times peak. This is done by the small wi-fi dongle you see above the wine rack when connected to marina wi-fi or indeed a mobile phone hotspot. 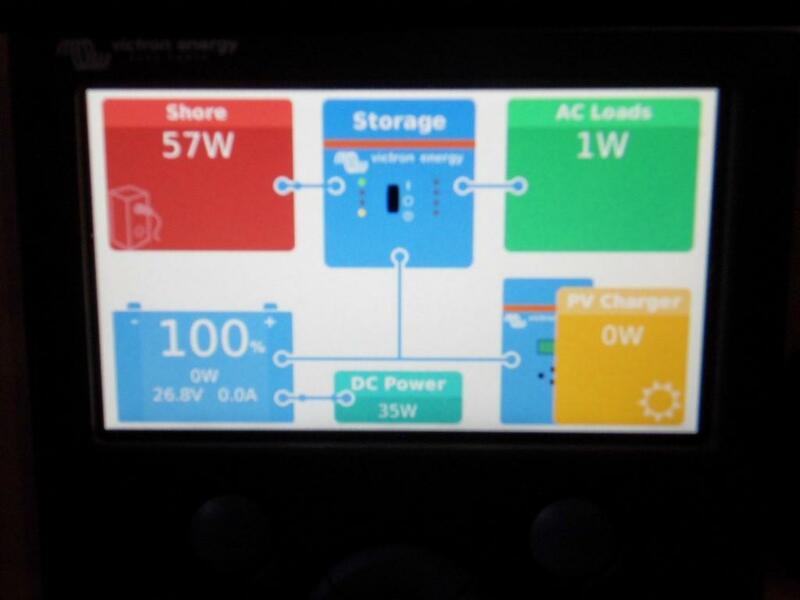 No need to use it but it is fun and you can see the battery state etc from anywhere in the world, switch stuff on/off, get email when shore power goes down and update Victron product firmware for example via the VRM (Victron Remote Management) web portal. Keeping it simple - all you need is the app in the cockpit and to keep an eye on battery levels when down below. New UV strips on jib and cutter. New sprayhood windows, new dodgers, all in last few years. All done by Owen Sails. All the safety kit and boat is to MCA CAT 2 Offshore (up to 60nm). 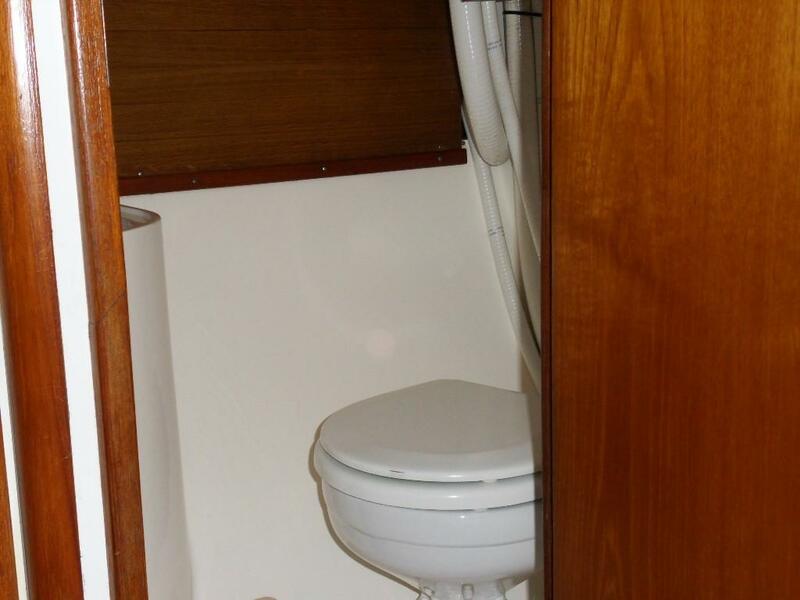 Though she has never been used the boat commercially it has been said - regardless it proves the boat is a well founded one. In fact the survey and STOPS stability calculation is better than CAT 2. 1 x Red Ensign and staff. 1 x Sea Anchor drogue. 1 x Emergency shroud repair and turnbuckle. 1 x Lifeline Throw bag. 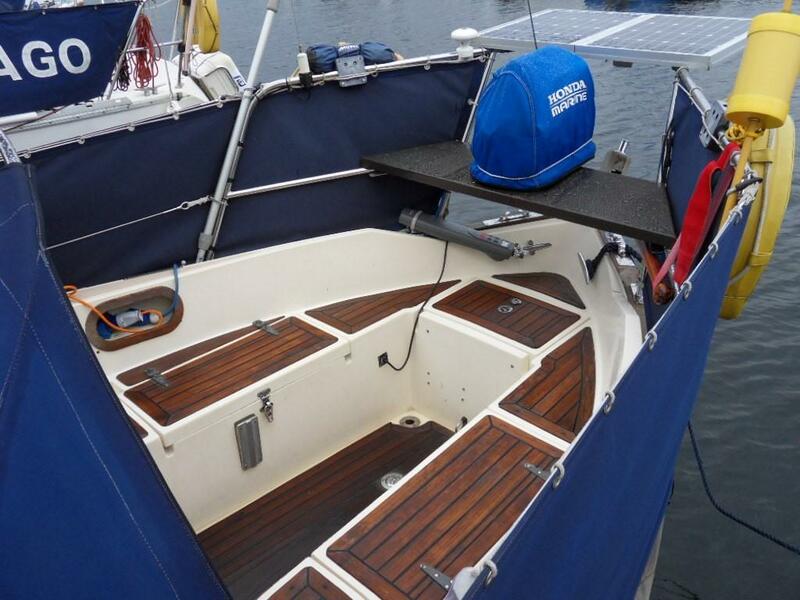 1 x Spinnaker & sail bags. Spinnaker pole on deck. 1 x Adjustable Salon or Cockpit table. 1 x USB Wi-Fi Dongle, plugged into Victron Color Control GX. 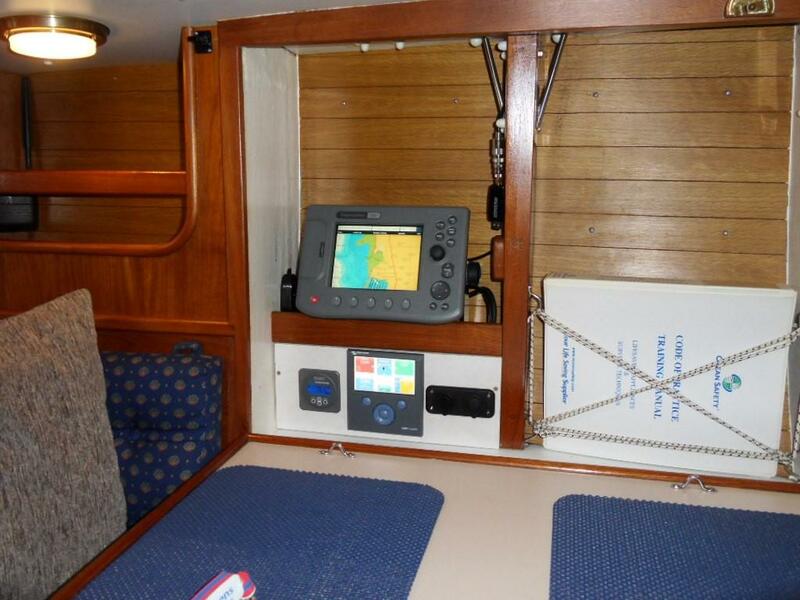 1 x Navionics Gold Card UK and Ireland charts for Raymarine plotter. 1 x Electric fan heater. 1 x USB AIS receive Class A & B dongle (connects and overlays AIS on a laptop with charting software). 1 x Emergency VHF aerial. 1 x AGA Stainless Steel Kettle. 1 x Water tank key and 1 x Aft Cockpit Hex key behind lighting panel. 1 x Ignition Key in ignition by lighting panel. 1 x Hatch and 1 x Ignition Key held by broker. 1 x Hatch to be retuned by J. Rushworth. Download the latest PDF specification of this Victoria 800.